Home > Food Facts > Is Yogurt Good for Acid Reflux? It often occurs shortly after, or during, the consumption of irritating foods and drinks, such as chocolate, spicy food, caffeine, alcohol, or carbonated beverages. The burning pain and discomfort of acid reflux may also be linked to smoking, obesity, medications, and a sedentary lifestyle. Conventional medical treatment often involves prescription drugs, which may cause serious side effects such as bone loss, vitamin and mineral deficiencies, and kidney issues. As such, an increasing number of doctors and patients alike look toward natural therapies such as probiotics. Is yogurt good for acid reflux, however? Some alternative medicine professionals recommend the fermented dairy treat as a possible option for acid reflux treatment. Certain acid reflux experts are promoting yogurt as a form of treatment due to its probiotic content. These living microorganisms balance the composition of bacteria found in the gut. An overgrowth of harmful bacteria in the small intestine may be responsible for stimulating the opening of the esophageal sphincter, which allows the stomach acid to enter the food pipe and cause acid reflux. The most common probiotics, or live cultures, found in yogurt are Lactobacillus bulgaricus and Streptococcus thermophiles strains. These bacteria convert the lactose in milk to lactic acid. Some yogurts also contain Lactobacillus acidophilus, Lactobacillus casei, and bifidus to help speed the healing of certain ailments and balance the digestive system. A probiotic-rich diet may offset the adverse effects of medications, such as painful cramping, bloating, and diarrhea. Acid reflux patients with a lactose sensitivity can also benefit from yogurt as it is lower in lactose than milk. Lactose-free or low-lactose dairy products are recommended on an acid reflux diet to prevent a rise in the levels of stomach acid. Yogurt may also provide relief from acid reflux and GERD symptoms. 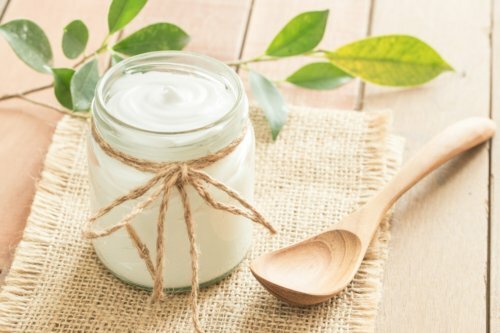 Although doctors often advise those with acid reflux to avoid foods high in saturated fats and trans fats, the polyunsaturated fats found in full-fat yogurt have been shown to reduce the levels of acid seen in this disease. Another yogurt benefit has been shown to be the probiotics’ ability to reduce inflammation within the digestive tract. The anti-inflammatory properties may lower the production of stomach acid. Furthermore, the sphincter muscle, which prevents the regurgitation of stomach acid, may benefit from the calcium content in yogurt. This mineral supports the muscles within the digestive system, including the sphincter muscle, by strengthening muscle contractions. Clinical studies have recommended probiotics as part of a healthy diet to ease acid reflux symptoms. A 2014 study published in the Pharmaceuticals journal found improvement in symptoms with the daily consumption of probiotic bacteria over a three-month period. A related study, published in the Scandinavian Journal of Gastroenterology’s September 2011 issue, also suggested the use of probiotic supplements to block regurgitation. The findings were based on symptoms and not the condition itself, resulting in more specific research being needed. In contrast, it’s been suggested that yogurt is not the end-all, be-all of cures for acid reflux. While some cases of regurgitation, burning, and discomfort are eased by the nutrients and probiotics in yogurt, other elements may see symptoms worsen. Yogurt is on a long list of foods and beverages experts recommend some acid reflux sufferers to avoid. Yogurt is a dairy product that often causes abdominal pain, bloating, diarrhea, and heartburn in those with a sensitivity or severe allergy to dairy. Regular cow’s milk and its byproducts were shown to irritate and stimulate acid reflux in a study published in the gastroenterology journal, Gut and Liver. Persistent bouts of acid reflux may result from following an acidic diet, which can include foods like yogurt. The lactic acid that forms when bacteria break down lactose makes yogurt acidic. These harmful acid reflux symptoms may appear when large amounts of yogurt are consumed daily. Although yogurt is better digested than regular’s cow milk, some people are unable to reap the benefits of the probiotics in yogurt. Another option may be probiotic tablets. The question also turns to the amount and type of probiotics required to lower the stomach acid that triggers acid reflux. No two yogurts are the same as the levels of acidity, the fat content, and the ingredients will vary. Also, no two digestive systems will react the same way. There are certain types of yogurt for GERD and acid reflux symptoms filled with probiotics that target harmful stomach acid and inflammation. Some low-fat and plain yogurt brands have little or no artificial sweeteners or added sugars. These additives have been shown to induce acid reflux. We noted above that many full-fat yogurts contain polyunsaturated fats like omega-3s, which appear to be beneficial for managing acid reflux symptoms. However, a large number of high-fat brands also contain saturated fats that can worsen GERD. This is why it’s very important to read the label and nutrition information before purchasing any product. Greek yogurt and acid reflux are often mentioned together as probiotic live cultures are found in this high-protein yogurt. In addition to containing more than two times the protein of other yogurts, Greek yogurt offers half the carbohydrates and sodium that often attribute to acid reflux. Medical professionals and researchers recommend consuming low-acid yogurt with a measurable pH level of 4.8 or higher. Some of the more popular brands of yogurts for acid reflux are outlined in the table below, as recommended by the team behind Dropping Acid: The Reflux Diet Cookbook & Cure. The probiotic and protein contents in yogurt have been shown to improve the digestion of food, lower stomach acid build-up, and strengthen the sphincter muscle. Probiotics also promote a reduction in inflammation. However, other studies suggest that the fat content and acidic nature of yogurt may only exacerbate GERD symptoms, canceling out any benefits of the probiotics. Talk to your doctor about whether the use of yogurt for acid reflux is right for you. Acid reflux can happen suddenly, but if symptoms are persistent, it should be treated by a physician. Over time, this condition can cause permanent damage to the esophagus and lead to further complications. “Can You Use Probiotics to Treat Acid Reflux?” Healthline; https://www.healthline.com/health/gerd/probiotics-for-acid-reflux, last accessed March 26, 2018. Chilson, M., “Probiotics and Heartburn: What You Need to Know,” News Max, August 26, 2015; https://www.newsmax.com/fastfeatures/probiotics-heartburn/2015/08/27/id/672045/, last accessed March 26, 2018. Maloy, O., “Acid Reflux Diet: Is Yogurt A Good Heartburn Remedy?” Steady Health, May 23, 2017; https://www.steadyhealth.com/articles/acid-reflux-diet-is-yogurt-a-good-heartburn-remedy, last accessed March 26, 2018. Bhatia, J., “Eating Yogurt and Heartburn,” Livestrong, August 14, 2017; https://www.livestrong.com/article/319500-eating-yogurt-for-heartburn/, last accessed March 26, 2018. Davenport, Dr. T., “Do Milk & Yogurt Make Acid Reflux Worse?” Livestrong, August 14, 2017; https://www.livestrong.com/article/445267-do-milk-yogurt-make-acid-reflux-worse/, last accessed March 26, 2018. “Can I Have Milk And Dairy Products If I Have Acid Reflux?” Doctor NDTV, February 24, 2018; https://doctor.ndtv.com/living-healthy/can-i-have-milk-and-dairy-products-if-i-have-acid-reflux-1775600, last accessed March 26, 2018. “Complementary Health Approaches for Irritable Bowel Syndrome: What the Science Says,” National Institutes of Health, July 2015; https://nccih.nih.gov/health/providers/digest/IBS-science#heading1, last accessed March 26, 2018. Koufman, Dr. J.A., “Are All Yogurts Created Equal?” Reflux Cookbook Blog; http://www.refluxcookbookblog.com/2010/03/01/yogurt-is-popular-but-is-it-good-for-reflux/, last accessed March 26, 2018. “Yogurt Nutrition,” Healthy Eating; https://www.healthyeating.org/Milk-Dairy/Nutrients-in-Milk-Cheese-Yogurt/Yogurt-Nutrition, last accessed March 27, 2018. Magee, E. MPH, RD, “The Benefits of Yogurt,” WebMD; https://www.webmd.com/diet/features/benefits-of-yogurt#1, last accessed March 27, 2018. “Yogurt Vs. Milk – Which One’s Better For Acid Reflux?” Sepalika, September 18, 2017; https://www.sepalika.com/gerd/yogurt-vs-milk-treat-acid-relux/, last accessed March 28, 2018.